Stan and Oliver prove that quality comedy is timeless. In this talkie short from 1930, Oliver is a henpecked husband, who is nagged into attempting to repair the radio aerial on the roof of the Hardy family home. Needless to say his best friend Stanley is happy to lend a hand. The film opens with a great skit, involving Oliver searching for his trademark bowler hat (unaware that it is sitting on his head!). In this scene Ollie proves that he is no mere straight man, hanging on to Stan's coat tails, he can pull off comedy timing with the best of them. Stan arrives on the scene in his car. He is obviously a great actor. Away from the big screen, having seen interviews with him, and knowing that he wrote a great deal of the material, and directed too he is no idiot, but his ability to pull off the gormless demeanour of the character he portrays on screen is pure bliss. 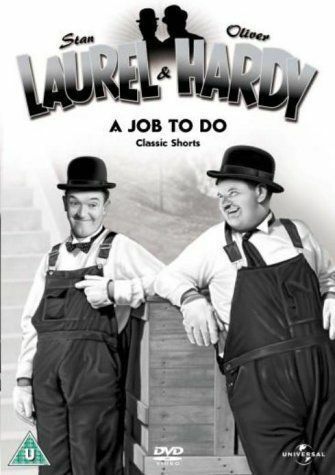 Ricky Gervais commented recently that one of the reasons he loves Laurel & Hardy, is that their comedy comes from the empathy that you feel for their characters, rather than laughing at their expense. The boys set about their task, in suitably slapstick style. No matter how many times I watch their movies, I never tire of their humour. Ollie's plaintive looks in to the camera lens when things go awry are priceless. The final section as the car veers wildly out of control is great, Stan was way ahead of Homer Simpson with his girlish screams (not to mention Ollie using "DOH!" on numerous occasions in their movies). And the gag at the end with the squished car is the perfect ending to a very enjoyable movie. These guys managed in 19 minutes what many so called film makers fail to do in 120!